This is the story that made Agatha Christie famous, and which was also one of her own favourites. It begins when the wealthy Mrs Farrars is found dead of an apparent overdose, one year after the death of her husband. The villagers of King's Abbot are suspicious, for local rumour has it that she poisoned her husband and was in love with Roger Ackroyd. Was it suicide, brought on by a guilty conscience, or could she have been murdered? When Ackroyd is found stabbed to death the following day, there is little to go on. Anyone in the house could be the culprit - Ackroyd's niece, Flora; Raymond, Ackroyd's secretary; or even Parker, the butler. 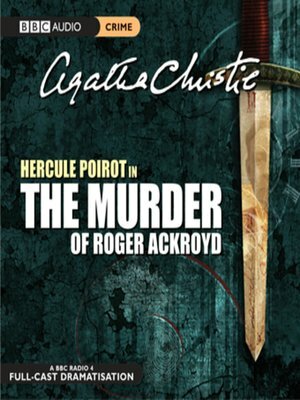 The prime suspect, however, is Roger Ackroyd's stepson, Paton, who has disappeared and is known to have gambling debts. Luckily, one of the newest residents of King's Abbott, who has retired to the village to cultivate marrows, is none other than the redoubtable Monsieur Hercule Poirot... This ingenious mystery is brought to life with a full cast including John Woodvine, Diana Olsson and Deryck Guyler.